Deputy Chief Minister Sukhbir Singh Badal today took on Senior Superintendents of Police (SSPs) who are in the habit of making Station House Officers (SHOs) part of their baggage when they are shifted from one district to another. Punjab farmers never had it so good as far as wheat production is concerned. The latest estimate prepared by the State Agriculture Department has indicated that wheat production is likely to go well beyond 170 lakh tonnes. It was on October 18, 2010, that foundation stone for upgrading the ayurvedic hospital at Model Gram in Ludhiana was laid by the then Health and Family Welfare Minister, Laxmi Kanta Chawla. Over 18 months down the line, the facility is yet to get operational. Union Rural Development, Sanitation and Drinking Water Minister Jairam Ramesh has backed Punjab's claim for a debt waiver saying the state had suffered a lot due to terrorism. Union Minister Jairam Ramesh today said he was a votary for more powers to the states. But, some states were adopting double standards by arguing for more powers from the Centre and refusing to empower panchayats at their end, he said. Union Minister Jairam Ramesh said the Comptroller and Auditor General (CAG) will be told to look into the diversion of Rs 2,000 crore allocated for centrally sponsored schemes. While there were reports of “missing record” from the Akal Takht Secretariat in the past, a recently released book, “Edicts of Sri Akal Takht Sahib” by Sikh History Research Board director Roop Singh, has become a reference document. Burning of wheat stubble is completely banned as per the prohibitory orders issued by all deputy commissioners across the state under section 144 of the CrPC. But a visit to the fields reveals that the orders remain only on paper. The myth of Ludhiana being the biggest revenue earner for the Punjab Government has been shattered. The industrial city, considered to be the Manchester of India, has lost its numero uno position to Mohali in terms of revenue collection for 2011-12. The Punjab State Power Corporation Limited (PSPCL) headquarters here has received complaints from a number of residents of Ludhiana and Patiala in the past few days against linemen and junior engineers allegedly demanding money for rectifying technical snags in transformers, wires etc. As the term of Punjab School Education Board chairman Dr Dalbir Singh Dhillon nears its completion on June 1, the case of giving him further extension has landed in the court of Chief Minister Parkash Singh Badal. To overcome procedural delays and shortages of medicines procured through military hospitals, the Ex-servicemen's Contributory Health Scheme (ECHS) has decided to outsource pharmacy operations to private vendors. The Union Minister of State for External Affairs, Preneet Kaur, has asked the Planning Commission to take steps to expedite action for implementation of the Scheduled Castes Sub-Plan (SCSP) on the pattern of Maharashtra model in Punjab. In a communication addressed to Deputy Chairman, Planning Commission, Dr Montek Singh Ahluwalia, the Minister has sent a copy of the memorandum that she received from the Chamar Mahan Sabha, through its president Paramjit Singh Kainth. Despite tall claims made by the state government, residents of Sangrur are unhappy over the lack of development in the district. A considerable chunk of Sangrur areas still depicts a picture of utter neglect as the Local Bodies Department and the Department of Rural Development and Panchayat have failed to provide even basic civic facilities to them. The Pathankot police has arrested two employees of Gurdaspur Central Co-operative Bank for allegedly looting Rs 35.80 lakh from the bank's Taragarh branch yesterday. A migrant labourer was killed while 13 others sustained injuries in an accident on the outskirts of the town today. He directed the state police chief to ensure that no SSP takes SHOs serving under him to his new place of posting. Sources said this practice, which was quite common, had turned several SHOs into henchmen of SSPs and become a medium of corruption for them. In another bold move, the government has decided to dismantle the current system under which SHOs are appointed by halqa (constituency) in-charges which included area legislators or senior Akali leaders of the constituency. This had resulted in weakening the institution of the SSP. The appointment of SHOs will now be done on merit alone as this post is being seen as one of the most important links to good governance. Under the new system, only those officers who are in the substantive grade of sub inspector or above can be posted as SHOs. Similarly, only officers with substantive rank of ASI will be eligible to be posted as police post in-charge. This rules out all officers with local rank, own rank or ad hoc rank or even those who are on attachment from battalions from holding both posts. The sources said there had been a sea change in the ideology of the SAD, which had earlier allowed its MLAs and leaders to control the district police force and use it to further its political goals. The party does not want the matter of police misuse to become an election issue as it had during the last assembly elections. Moreover, it feels that if the government is confident of delivering it does not need any auxiliary support to seek an advantage. This change in thinking has emerged from the fact that though politicians and bureaucrats had written off the last government, the people did not because they felt it had delivered on certain issues. SAD president Sukhbir Singh Badal is keen to improve this delivery mechanism and has decided to give the DGP a free hand in weeding out incompetent officers, besides giving a message to Akali legislators that they have to win over people with performance alone. The Police Department has transferred 36 SHOs and 92 police post in-charges who had been appointed at the instance of the area legislator or senior leaders. DGP Sumedh Singh Saini has issued a circular to all SSPs and police commissioners in this regard and all officers are expected to file a compliance report by May 14. “We have informed the authorities that it should be prepared to procure wheat up to 125 lakh tonnes,” said Mangal Singh Sandhu, Director, Agriculture. Initial estimate was to procure 108 lakh tonnes and later it was revised up to 115 lakh tonnes. However, already about 121 lakh tonnes have been procured by the government agencies. Arrival of wheat is likely to continue in some select markets for the next few days. 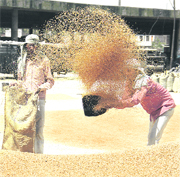 There are farmers who had a return of up to Rs 40,000 per acre from wheat crop this year. The return also includes value of dry fodder prepared from wheat stubble. “There has been a sudden jump in per acre yield of wheat this year,” said Gurdev Singh, a farmer from Mansa district. “Punjab’s per hectare average yield is likely to touch a figure of 48.5 quintal this year and it will be a new record,” said Sandhu. What were the main factors which led to a record production of wheat this year? Punjab Agricultural University says beside other factors, the most vital role in record wheat production is played by prolonged winter this year. “Climatic conditions in February and March, which is considered a crucial period in wheat crop life cycle, remained highly favourable for the crop to flourish and mature,” said SS Gosal, Director, Research, PAU. “Grain formation was excellent this time,” he added. Most of the wheat varieties grown in the country have Mexcian lineage and flourish in cold conditions. However, these are intolerant to sudden temperature variations at the maturing stage. Other reasons listed by Gosal and Sandhu for the high yield include good results of some newly released wheat varieties, better pest and disease management especially that of attack by yellow rust in the area along the Kandi belt, farmers’ growing habit to use fresh seed, also known as seed replacement, and improved harvesting techniques. Among the varieties which farmers say have given good yield include PBW 611 and 621, HD 2967, HD 2932 and HD 2851 and DBW 17. Even states like Haryana, Madhya Pradesh and Rajasthan have also done well on this front. Madhya Pradesh’s contribution to the Central wheat pool will be in the range of 80 lakh tonnes this year and Rajasthan’s about 15 lakh tonnes. Rajasthan and Madhya Pradesh state governments give Rs 100 per quintal (in addition to the minimum support price) as bonus from their treasury to farmers who contribute wheat for the national pool. Bonus is given to promote the farming of cereals by both the states. Constructed at a cost of Rs 37 lakh, the 10-bedded hospital was to be upgraded to a 50-bedded facility. Apart from Ludhiana, four more ayurvedic hospitals in Jalandhar, Hoshiarpur, Amritsar and Bathinda were given grants for expansion. The project was funded by the Centre and had to be completed within five months. Now that the construction work has been completed, these hospitals have been awaiting recruitment of health specialists by the Union Government’s Department of Aayush (ayurveda, yoga, unani, siddha and homeopathy). The hospitals were meant to provide treatment on the ‘panchkarma’ pattern. Eight recruitments, including two each of expert, doctor, pharmacist and massager, are to be done in each of these hospitals. “Successive governments (at the Centre) have failed Punjab. Why should Punjab pay for fighting terror? I will raise the issue in Delhi,” he said while speaking to The Tribune after addressing a joint session of Punjab MLAs and deputy commissioners in Chandigarh. Chief Minister Parkash Singh Badal said, "We have pursued our demands with the Centre a number of times, but to no avail." Addressing the joint session, Ramesh said nobody could deny the role played by Punjabis in the national freedom struggle, besides ensuring food security for the country. The Union Minister also advocated a special package to Punjab for checking water-logging and providing safe drinking water. He said he was a supporter of greater autonomy for states in terms of using central funds. Accompanied by Deputy Chief Minister Sukhbir Singh Badal, Ramesh had yesterday toured rural areas of Punjab. He said he had realised Punjab had its own unique problems, which needed “more liberal solution”. The Union Minister said the Centre would provide separate funds to Punjab for upgrading roads in six border districts, including Amritsar, Gurdaspur, Ferozepur, Fazilka, Tarn Taran and Pathankot, under the Pradhan Mantri Gram Sadak Yojna. On water-logging, which had affected nearly four lakh acres in Muktsar and Fazilka districts, he said he would soon set up a technical expert committee for exploring ways to tackle the problem. About Punjab, he said non-constitutional methods were being adopted to limit the power of panchayats and said it was ironical that a 'halqa' (constituency) incharge was very 'majboot' (strong). The Minister equated 'halqa' with being lightweight. 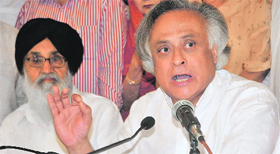 Jairam Ramesh said constituency incharges in Punjab did not have any right to distribute money allocated by the Centre. "We give money to the state government. How does the 'halqa' incharge come in the way," he asked. The Union Minister also made it clear that there was no politics in the distribution of funds for rural development nor had there been any when he was heading the environment ministry. "I gave Rs 700 crore for cleaning the Ghaggar and Sutlej and even now will allocate funds as per the needs of the state," he said. He said discrimination, if any, against Punjab happened during the NDA rule when Prime Minister Atal Behari Vajpayee gave a special industrial package to Himachal Pradesh. He said the industry in Punjab shifted to Himachal because of this. 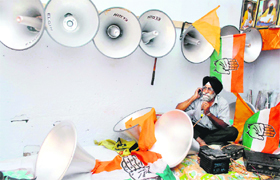 "This happened when Sukhbir Badal was the Union Minister of State for Industries," he added. Ramesh said this when his attention was drawn to an admission by Punjab Finance Minister Parminder Singh Dhindsa that central funds had been used for purposes other that what they were meant for. The issue was raised by Congress Legislature Party leader Sunil Jakhar during an interaction with the Minister at Punjab Congress Bhawan here today. Jakhar urged appointment of a judicial commission to look into what he termed as "misappropriation" of central funds by the state government during its previous tenure. The CLP leader said the Congress had already raised the issue with Congress president Sonia Gandhi as well as Prime Minister Manmohan Singh and that an investigation needed to be carried out to uncover details of "misappropriation". While there were reports of “missing record” from the Akal Takht Secretariat in the past, a recently released book, “Edicts of Sri Akal Takht Sahib” by Sikh History Research Board director Roop Singh, has become a reference document. It incorporates 151 edicts (hukamnamas) issued from the Akal Takht over the past 125 years. The oldest edict in the book dates back to March 18, 1887, and the latest one to be included is the one issued on July 22, 2011. This is the first book to deal exclusively with the edicts. The book has some of the rare edicts, including the one directing the Sikhs to be armed for the protection of the country after Independence. The edict issued on Diwali (in 1948) by the then Akal Takht Jathedar Giani Mohan Singh Nagoke directed the Sikh masses to pray for getting the “Hindu sisters” liberated from the newly-created Pakistan. The maximum edicts issued from Akal Takht were after Operation Bluestar (June, 1984). The Akal Takht issued 14 edicts from July 5, 1984, to October 25, 1984, condemning the siege of Golden Temple and Akal Takht by the Indian Army. Giani Kirpal Singh was the Akal Takht Jathedar at that time. The book also has Akal Takht edicts, declaring former President Giani Zail Singh and former Union Home Minister Buta Singh “tankhaiya” and ostracising them from Khalsa Panth, besides the one awarding “tankhah” (punishment for religious misconduct) to former Punjab CM Surjit Singh Barnala. While most edicts (a total of 30) were issued after the Army operation in 1984 by the then Jathedar Giani Kirpal Singh, Bhai Ranjit Singh had issued as many as 18 edicts in his short tenure of 14 months. The issue of missing records from the Akal Takht came to the fore in April 2003 when the newly formed secretariat of the Takht had requested both Sikhs and non-Sikhs to submit records related to the office of the Akal Takht so that the new secretariat is complete in all respects. There were reports that a few jathedars, who had been removed or had retired, had taken home important office records, including correspondence and copies edicts. Immediate after sunset, farmers start burning stubble after pouring kerosene or petrol on their fields. This results into thick clouds of smoke, making visibility poor on roads, which in turn poses a risk to motorists. Another worrying factor is that this illegal practice pollutes environment and depletes soil fertility by burning essential nutrients. A survey of villages in the district revealed that almost every farmer has burnt stubble on his fields and there is no instance of official action against any farmer. A fuel station owner on the Muktsar-Bathinda road said two days ago, when a farmer put his paddy stubble on fire near his fuel station, it posed a grave risk to his property as just one flame could have resulted into a major tragedy. The situation is worst on the link roads connecting villages. Farmers say this is the cheapest way to clear their fields for next crop. Deputy Commissioner Paramjit Singh said: "I have directed the SSP to challan all those found violating the ban order imposed under section 144 of the CrPC". He accepted that no challan had been issued till date, but assured to take a strict action in near future. For decades, the Punjab Government looked at Ludhiana as its main saviour to bail it out for its financial requirements. But today, Mohali with revenue collection of Rs 438 crore has marched ahead of Ludhiana by Rs 18 crore. Ludhiana collected Rs 420 crore and Amritsar, despite being a border district, collected Rs 239.78 crore for the government. Sources in the office of Revenue Minister Bikram Singh Majithia say the top revenue collection districts in Punjab will benefit from the government in terms of funds allocations for development in direct proportion to their contribution towards the state’s earning. The state government has maintained that the Central Government must return 70 per cent of the collection from taxes back to the states. The state has, in turn, decided to reward areas within the state on the same principle. After Mohali (Rs 438 crore), Ludhiana (Rs 420 crore) and Amritsar (Rs 239.78 crore), Jalandhar comes next with a collection of Rs 232.63 crore. In all, the state during 2011-12 earned total revenue to the tune of Rs 3092.42 crore that was Rs 724.77 crore higher than (Rs 2367.65 crore) that was earned in 2010-11. The revenue collection in Punjab has been on a considerable rise each year. In 2009-10, the total revenue collection was Rs 1,562.15 crore, nearly doubling in two years. After Mohali surpassed Ludhiana, the Revenue Department has asked Mohali to achieve a target of Rs 610 crore this year, while Ludhiana’s target has been raised to Rs 590 crore. Only a handful of district has generated good revenue for the state. These include Patiala (Rs 164 crore), Bathinda (105.43 crore), Pathankot (Rs 22 crore), Fazilka (Rs 39 crore), Tarn Taran (Rs 53 crore), Mansa (Rs 58 crore) and Ropar (Rs 61 crore). Mohali Deputy Commissioner (DC) Varun Roojam told The Tribune that the main reason for rapid rise in revenue collection in the district could be attributed to stringent enforcement of taxation policy and vast development and urbanisation in and around the district. Roojam said, "Lot many developers and colonisers have shown interest in Mohali and areas including Zirakpur, Mullanpur, Dera Bassi etc. The state government is also coming up with mega projects in Mohali. This is perhaps the major reason that people have shown interest in Mohali in recent times." "Whenever there is a power failure on account of some snag, linemen ask the complainant to arrange staircase, uses rough language and behaves in an irresponsible manner. Furthermore, once the power is restored, they straightaway ask money, claiming that they have to deposit the same with the stores department in lieu of material used for restoring power. If one ask for receipt, they refuse, which makes it clear that they are asking for bribe", alleged Jeevan Ram, a resident of Gurbax Colony. 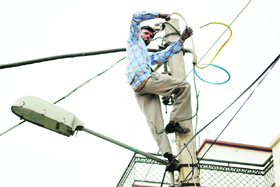 In another complaint sent by a Kocchar Market shopkeeper in Ludhiana to the PSPCL CMD KD Chaudhary and PSPCL Director (Distribution) Arun Verma, the shop owner stated that on May 8, 2012, there was a power failure in his shop and despite repeated complaints to the power corporation no heed was paid to rectify the snag. "After running from pillar to post, the power was restored the next day but that too in an improper manner. Minutes after, there was again sparking in electricity wires and power went off. Local staff of the power corporation not only acted in an irresponsible manner but deliberately delayed the repair work," he alleged. These are not the only cases, in the past one-week, The Tribune received several telephone calls from domestic and commercial power consumers in Patiala, who alleged that linemen and JEs mistreated them and asked for "bribe". "The situation has become so bad that the power corporation employees not even spare women and senior citizens and misbehave with them too," said Geeta Vohra, a resident of the city. Enquiries brought to light that the problem is prevalent in almost all the areas of the industrial town of Ludhiana as well. Meanwhile, senior PSPCL officers preferring anonymity said they were aware of the problem but were helpless due to strong union of the linemen and the JEs. PSPCL Director (Distribution) Arun Verma says any category of the power consumer, having any problem with respect to the conduct of employees, responsible for rectifying technical snags, can straightaway send a written complaint to his office and in case the PSPCL employee is found guilty, strict action will be initiated against the erring employee. "Whenever we receive a complaint and found the same genuine, we do take necessary action against erring employees. However, the problem remains there as majority of the complainants do not take up the matter with the senior authorities but still I will look into the matter to ensure that PSPCL provides people-friendly services", he added. The case now hinges on the fate of complaints against the PSEB chairman that Education Minister Sikandar Singh Maluka had forwarded to the Chief Minister for suitable action. Without disclosing details of the complaints, the Minister said there were about 12 complaints that had been forwarded to the CM for suitable action. " Let the CM decide about the case, only then I will be able to disclose anything," he says. A few days ago, the Minister had received complaints regarding procurement of printing paper and textbooks. While recommending a high-level inquiry by an investigating agency, the Minister had forwarded the case to the CM. Dhillon said he was open to any inquiry. "I have acted in a fair manner. Certain unscrupulous elements in the board are making bogus complaints against me." Now, vendors would be required to stock the requisite medical supplies through their own sources and distribute them to ECHS beneficiaries as per their prescriptions at the pre-fixed discounted rates. The bill for these medicines would be borne by the ECHS. "A pilot project to outsource pharmacy operations is being undertaken at 77 ECHS polyclinics attached to 29 hospitals across the country," an ECHS official said. "An analysis of the outsourcing operations would be carried out over a period of one-year from the date of launch to study its effectiveness and deciding on the future course of action," he added. This includes 16 polyclinics in Punjab and Himachal Pradesh that are attached to six military hospitals located in Chandigarh region. The government-sponsored ECHS has a total of 426 polyclinics besides about 1,400 empanelled private hospitals that provide medicare to about 40 lakh retired armed forces personnel and their dependents. It has an operating budget of over Rs 1,000 crore with Rs 450 crore earmarked for procurement of medicines. Under the present system, the Director General Armed Forces Medical Services (DGAFMS) is responsible for procuring and ensuring availability of medicines, for which funds are placed with them by the ECHS. The DGAFMS sub-allocates the funds to various medical supply depots for central procurement and to military hospitals for the local purchase of medicines. These medicines are then transferred to the ECHS polyclinics. Non-availability of medicines had been a cause of concern for quite some time as under the aforementioned procedure, it took 6-8 weeks to purchase medicines and even emergency procurement by hospitals was affected. Further, no additional staff had been authorised to the DGAFMS to cater to the ever-increasing additional load of the ECHS. A meeting of vendors would be held at the ECHS headquarters later this month, where they would be familiarised with the modalities of the outsourcing operations before a tendering process is undertaken to award contracts. Preneet stated that Kainth had insisted that since the SCSP Maharashtra model was the brainchild of the Planning Commission of India, it was now the responsibility of the Commission to have it implemented in Punjab as well. 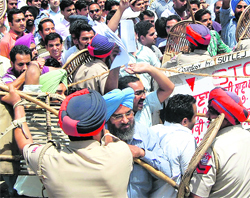 “Article 46 of the Constitution of India directs the state governments to promote with special care the education and economic interests of the weaker sections, Scheduled Castes in particular, protecting them from social injustice and other forms of exploitation”, reads the memorandum submitted to Preneet by the Sabha. Whether it is an urban area or rural - residents are extremely perturbed over “indifferent” attitude of the successive state governments for not paying any heed for the over-all development of the district. While interacting with The Tribune, a majority of the people flayed the state government for not taking requisite steps to ensure that residents get proper civic facilities - water, roads and sewerage. While the problem of poor roads is a major concern in the city, inhabitants of various assembly segments in the district, including Dhuri, Dirbha, Lehra, Malerkotla and Sunam, are facing the problem of water scarcity. 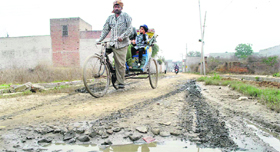 “We reside in the city and can you imagine there are no metalled roads and proper sewerage system in our area,” said Raghuveer Singh, a resident of the Dhuri Road. Shamsher Singh, a resident of Ladda Kothi village, which is located under Dhuri, said, “Surjit Singh Barnala and Rajinder Kaur Bhattal, both hail from Sangrur, had remained as chief minister of Punjab but unfortunately on the development front, Sangrur is still backward. Can you imagine, for boarding a bus people from dozens of villages have to travel several kms.” A visit to various areas of Malerkotla brought to light that heaps of garbage is common in almost every area. Sunam and Lehragaga are grappling with water scarcity. Inhabitants of Lehragaga say there has been no redressal to their complaint about problem of water shortage. “What is unfortunate is that politicians come with big promises during elections and once they become MLA or Minister, issues of the commoners take the backseat,” said Jagriti Sachdeva, a housewife and resident of Sangrur city. On suspicion, the police interrogated bank's cashier Sham Lal, who admitted to the crime. The other accused has been identified as Rajinder Kumar, who works at the bank's Shahpur chowk branch. SK Kalia, SSP, said Rs 22 lakh had been recovered from the accused. He said Sham Lal had tried to hoodwink the police by claiming that he had been injured by three robbers who decamped with the booty. The SSP said Sham Lal went to the bank yesterday morning a little earlier and minutes later, Rajinder entered the bank. The cashier handed over the money to Rajinder, who, after inflicted injuries on Sham's forehead, left the place. Later, Sham told the police that some youths entered the bank and forcibly took away the cash after injuring him with sharp-edged weapons. Eleven labourers hailing from Saharsa district in Bihar were on their way to Smadh Bhai (Moga) from Phagwara on a commercial goods carrier (chota haathi), which collided with a canter coming from the opposite direction. Raj Kishore died on the spot while condition of the three of those injured in the accident was stated to be serious. They are undergoing treatment at a hospital in Ludhiana. The rest were admitted to the district hospital in Moga.